Manchester United manager Jose Mourinho has reportedly personally got in touch with the entourage of Real Madrid defender Raphael Varane to discuss a transfer. The France international looks to be surprisingly out of favour at the Bernabeu at the moment, following the arrival of Julen Lopetegui as the club’s new manager. This is despite Varane enjoying a superb World Cup campaign in the summer, helping the French side to their second victory in the competition with a series of commanding defensive displays. 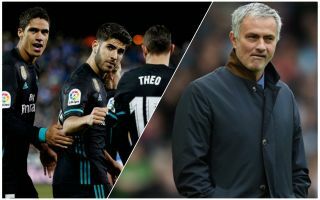 Generally regarded as one of the finest centre-backs in Europe for a few years now, it seems Varane has now fallen behind Nacho in the pecking order, and Don Balon report that Mourinho has moved to try to take advantage. The Portuguese tactician is described in the piece as being a long-time admirer of the 25-year-old, whom he brought into the Madrid first-team during his time as manager there. CaughtOffside were also informed that United held talks with Florentino Perez about signing Varane in the summer, and that they were ready to pay as much as £100million for him, though this deal never materialised. At the time, Real were not keen on selling, but it’s easy to imagine that could change if he continues to find himself out of favour.